to get for what you have. Thank you for following our request. 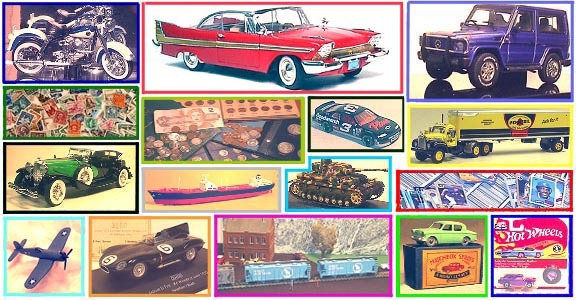 BUYING model trains in any scale including Z, N, HO, O or LGB. This also includes anything in the way of BUILDINGS, TRAINS, ACCESSORIES or VEHICLES. BUYING Diecast or Plastic model car and truck collections by any manufacturer. This includes MATCHBOX, HOTWHEELS, ERTL and any other company that you may be looking to sell. BUYING Plastic model kits by any manufacturer in the way of Buildings, Ships, Planes, Cars or Trucks. BUYING United States Coins including Pennies, Nickels, Dimes, Quarters, Half Dollars, Silver Dollars, Gold pieces or Currency bills. Some types of foreign collections and any US stamp collections dating before 1940. BUYING Hummels, Goebels, Disney, David Winter, Lilliput Lane, Royal Doulton and more. Please ask. BUYING any OLD or NEW Gold & Silver Jewelry. Also, Gold & Silver in any form including Bars, Silverware, Tableware, Watches, Scrap Metal or even DAMAGED items of any of the above. IF YOU THINK YOU HAVE SOMETHING WE WOULD BE INTERESTED IN BUYING, LET US KNOW BY SENDING US AN EMAIL. JUST CLICK ON THE MAILBOX AT THE LEFT SIDE OF THIS PAGE. WE WOULD BE GLAD TO LISTEN TO YOUR OFFER TO SELL US YOUR ITEM(S). WE ARE ALSO OPEN TO GIVING YOU CREDIT ON UNWANTED COLLECTIONS TO FORWARD TOWARDS THE PURCHASE OF ITEMS THAT WE SELL.